The maps are full color and nicely drawn. 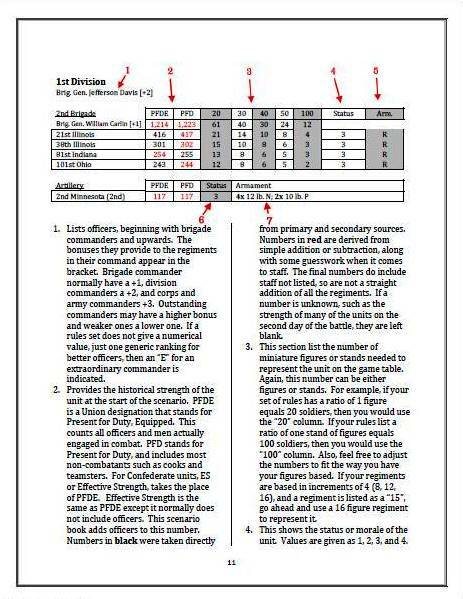 The OOB and the regimental strengths are quite good and are drawn from many different sources. Actual versus estimated strengths are delineated. The author includes a historical background for the battle, as well as for each individual scenario. Full color photographs of the modern battlefield sectors are included within the corresponding scenario, giving the gamer who has not been to Chickamauga (or in my case, only once before) some general idea of the terrain and locale for the tabletop layout. The book is a bargain in terms of page count and content (it is more than 120 pages in length, but is easy to read and hard to put down). The history lessons by themselves are well worth the price at $14.99 USD for a digital download that you can print yourself of copy to your hard drive. Brad Butkovich is to be highly commended for this effort! As a long-time scenario designer with several books of my own, I can appreciate the amount of time and effort (not to mention research and reading) that Brad must have put into this project. 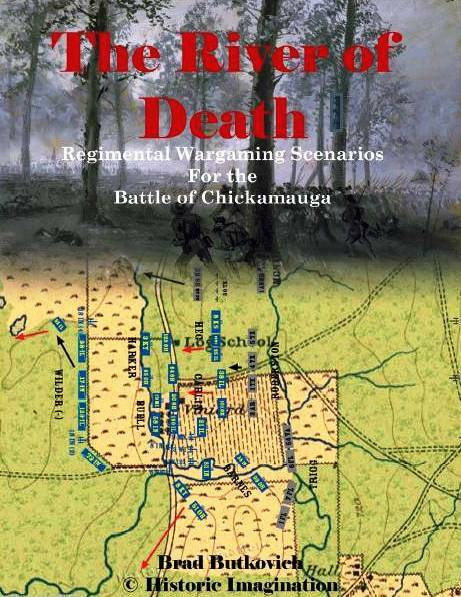 River of Death is published by the Wargames Vault, which has dozens of other Civil War products available for download, including paper soldiers and accessories, rules sets, historical commentaries, and other products of interest. Thank you for the kind words Scott! I can’t wait to hear how people play out the new scenarios. Any other reviews so far? As much as I can tell from the cartography it looks like actual elevations rather than interpreted; are the maps from another source with unit graphics imposed upon them? The scenario maps are based on my work for my website, Civil War Virtual Tours. You will note that the audio speech is text to voice using sophisticated software, not an actual person speaking. There is some flash animation as well, and even my own website at imagineimage.org doesn’t have some of those features as the K-Flex site does. Re: the maps. I understand not wanting to use approximate maps but the only problem there is with that is that the National Geographic or US Geological Survey Maps do not enable a clear understanding of the terrain as the maps are muddled with details. It would perhaps be far easier to have taken an existing Game map and asked permission to enhance it with animation overlays, or draw your own based on those game maps, because those game maps are already vastly researched and the locations of things are well and clearly illustrated. For instance, one could not possibly do what you have attempted with maps of the Bastogne area in WWII; it is simply impossible because of the scale to show cartographic lines or elevation lines as opposed to elevated “regions,” e.g. that’s what was done to create hex grid maps of the Chickamauga field and so many other battle games. The Avalon Hill Quad Game showing Shiloh (pitiful representation) and Chickamauga among others is one example. The Chickamauga map was actually the best one in that set. All I’m saying here is user experience; in fact, I would not do this at all using HTML and I would have actually made a video by placing the maps in video editing software, then producing a Flash or swf output. If you want to consider these options, feel free to contact me; I would be honored to help. I don’t really understand. The only time a new window opens up on my website is when you click on a picture to get a larger, higher resolution image. Clicking through the maps doesn’t open new pages. As far as the maps go, the site is designed for research and understanding the battle, not wargaming. They are made to be printed out and taken to the battlefield as a guide, so I’m not interested in animating them. So, the maps have everything a map would have. Contour lines, buildings, foliage, fences, etc. I guess its just a matter of taste. Thanks for the tips. I don’t want to clog up Scott’s blog talking about my website. If you have any further questions or suggestions, use the Contact Us page or forum on Civil War Virtual Tours.